Watch out Turkish politics watchers, you’re in for a bumpy ride: Opinion pollsters have opened the hunting season and they’re out to hijack your Twitter feed. Sure, at first, you’ll be seduced by the multicolored array of pie charts. You’ll enjoy the numbers churned out by polling companies whose names you don’t recognize. You’ll follow anyone who makes the best-looking graphs. Polling Company X says Party A will win another term in government, you’ll note with interest, while Pollster Y reckons Party B won’t cross the 10 percent threshold. But you’ll soon realize this material isn’t an analytical goldmine; it’s quicksand, and you’re sinking in the detritus. Your suspicions will first be aroused when you notice the slices of your Monday morning pie chart add up to 107 percent. On Tuesday, Pollster X will tweet a warning telling everyone to ignore a “fake poll” using its logo that is doing the rounds on social media. By Wednesday, you’ll be swearing on life that you’d seen Pollster Z’s data under Pollster Y’s logo just the other week. We all want a better idea of where Turkish public opinion lies in the run-up to the general election, but it feels like the pollsters are out to cloud our judgement. Why is it that the OCR polling company can predict a runaway victory for the Justice and Development Party (AKP) on the same day that Gezici, a rival, confidently declares the same party’s fall from grace? Turkish polling is notoriously prolific and notoriously unreliable. The pollsters happily tell us the results of their latest voting intention research, but they rarely say how many people they spoke to, where they live and how they previously voted. Not one ever publishes full result tables for anoraks like me to pore through. It is a markedly different approach from Britain, for example, where pollsters fall over themselves to publish their data. For them, political polling is not something that makes serious money; it is a way of attracting potential corporate customers. Critics say the Turkish polling scene is full of cronies trying to alter the public’s perceptions in favor of their favorite political party. But that’s not altogether fair: I run a whole website that tries to draw out what’s interesting from the publicly available opinion polling and there are things to lean, provided you follow rules of thumb. First, ignore the results and watch for the trend. A polling company may unearth a stunning lead for Party A or find Party B won’t reach 10 percent, but wait and see if it produces a similar result in its next survey. Polling has its spikes and troughs and that spectacular result could have easily been a statistical anomaly. Second, be wary of surveys that project the number of seats each party will get. Turkey’s election system is complicated, due to its use the D’Hondt method in 85 unevenly-sized districts with a 10 percent national threshold, and the country’s vastness. A pollster who speaks to 1,000 people in twelve cities is not going to generate an accurate enough picture to account for regional differences. Third, the pollster you should respect the most is the pollster who tells you how many voters have not made up their mind. Most Turkish pollsters regard undecided voters as an inconvenience and distribute them proportionately among the parties – this is the “Bağımsızlar Dağıtılmış” (independently distributed) approach. It might generate pie charts of parties whose vote share neatly adds up to 100 percent, but it completely ignores people who say they will vote and haven’t decided who for. So, with all this in mind, here is what Turkish polling has told us so far: There is a slight drop in support for the AK Party, but it isn’t anywhere close enough to change the government. I have not seen a single poll anywhere since Gezi Park that hasn’t shown a clear AK Party lead. Talk of a coalition government, for the moment, is unrealistic. 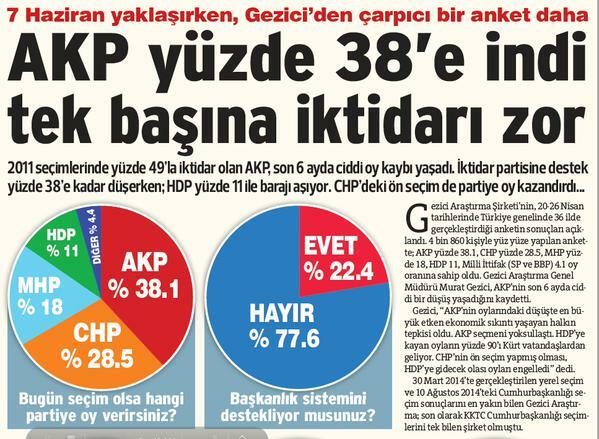 The CHP doesn’t appear anywhere near the 35 percent its leader predicted a fortnight ago; the main party to benefit from a drop in AK Party support is the MHP. The hardest prediction to make is whether the HDP will cross the 10 percent threshold: The only thing I can say for sure is that the result will be tight. Keep watching the polls for more clues. I certainly will be. Have you seen this (in Turkish)? They use a regression model to get rid of the pollsters’ biases.